The latest Morningstar Fund Flows Commentary showed that long-term fund flows rebounded in January after experiencing December doldrums when volatility spurred year-end sell-offs in 2018. After $83 billion of outflows in December, long-term fund flows received $39 billion. However, this was remarkably less than previous years with $63 billion in January 2017 and $132 billion in January 2018. Among the Morningstar categories, taxable bond fund flows equaled $31.5 billion, which marked its best performance since January 2018--a sign of investor shifting to safe-haven assets following 2018's year-end volatility. Passive taxable bond funds saw a record $27.6 billion while ultra-short bond funds garnered only $2.3 billion--its weakest month since September 2017. After a horrid 2018, a rebound in emerging markets was also evident. Diversified emerging-markets funds in January collected $10.9 billion in inflows, which was the category's best month since January 2018. Further tailwinds for emerging markets could lie ahead as the U.S. dollar begins to reverse from its initial strength in 2018. This bodes well for the iShares MSCI Emerging Markets ETF (EEM) , which is up 8 percent thus far in 2019. Rising interest rates translating to a stronger dollar have hurt gains for emerging markets, but last month, the Fed voted unanimously to hold its policy rate in a range between 2.25 percent and 2.5 percent. More dovishness by the Fed in 2019 can help keep dollar gains in check for the rest of the year. One notable was the number of outflows from passive funds in January while active funds remained static. Per the Morningstar report, "January's biggest surprise may have been the relative flows for active and passive U.S. equity funds. Passive funds fared worse than their active counterparts for the first time since January 2014. U.S. equity funds had modest outflows of $3.8 billion overall, despite the S&P 500 gaining 8% (the index's best January since 1987). On balance, these outflows came from passive U.S. equity funds, while active flows were flat." Since the majority of exchange-traded funds (ETFs) are passive, this reflected in their flow performance. ETFs received only $2.5 billion compared to $36.6 billion for their open-end counterparts--a rarity since ETFs have typically dominated in this category. 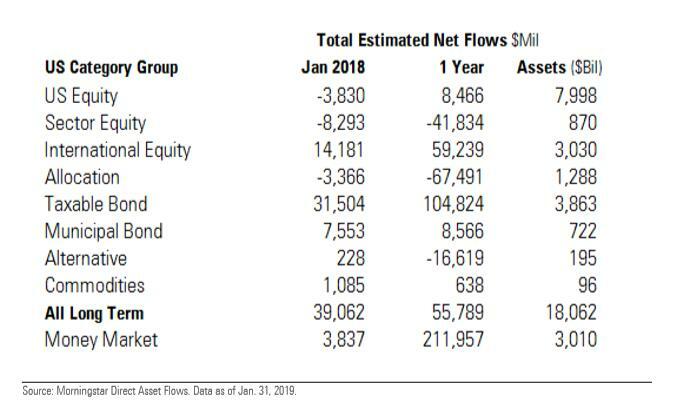 Per the report, "January was the first time since March 2018 that open-end funds enjoyed stronger inflows, and the $34.1 billion advantage in flows was the greatest since March 2014. 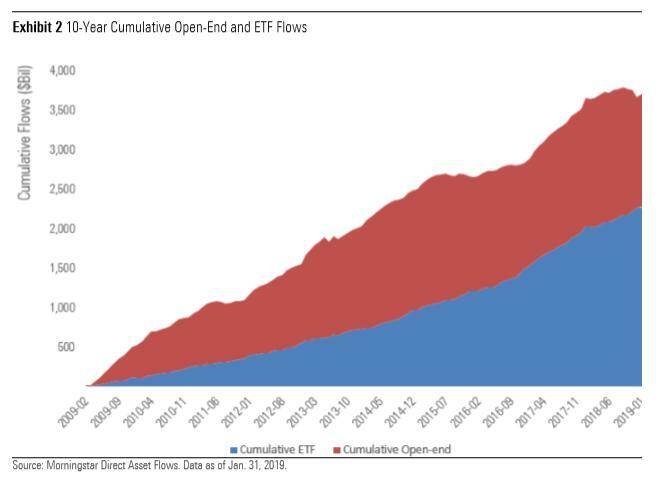 Over the past 12 months, open-end funds had $184 billion in outflows versus ETFs' $240 billion in inflows."